(MENAFN - Morocco World News) Rabat- A photo of the Casablanca mayor making himself comfortable in a first class train cabin has gone viral, triggering the criticism and mockery of Moroccans. Rabat- A photo of the Casablanca mayor making himself comfortable in a first class train cabin has gone viral, triggering the criticism and mockery of Moroccans. 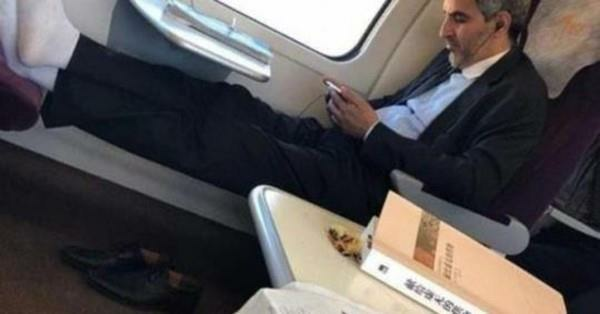 The photo showing Mayor Abdelaziz El Omari, a Justice and Development Party (PJD) member, seated nonchalantly with his socked feet resting on the seat in front of him in a first class ONCF shuttle train cabin, has inspired online controversy. Moroccans were especially angry because train rules forbid passengers from acts like putting their feet up on the seats or invading other passengers' seats. The photo, which has been circulating social media since Sunday, has been shared with captions such as 'photo of the day' and received sharp comments criticizing El Omari's attitude, posture, and even his clothes. Recently, Casablanca's inhabitants have been denouncing the city's condition, mainly pollution and 'bad odor' spreading through its outskirts and destroying the environment. Some of the commentators went as far with the sarcasm as to blame the bad smell in the city on the mayor's socks. 'So these socks are the cause of the unbearable smell in Casa[blanca]!,' the Facebook commentator wrote. Aside from the controversy following the train passenger who happened to be the economic city's mayor, the National Railway Office (ONCF) train itself is caught in a controversy of its own. Last week, Moroccan passengers decided they have had enough of the continued train delays of the only rail transport provider in the country, ONCF, calling for a boycott. A crowd of passengers blocked the tracks at Temara train station near Rabat, just south of Rabat, on Friday, October 26, due to a delay that lasted for three hours. Angry protesters told Morocco World News that they had been waiting for their train since 7 a.m. They left the tracks at 11 a.m. Some even lost their jobs due to the daily delays. What had added to the anger and frustration of travelers was the 'uncooperative' officials of ONCF, the 'intimidating' police who tried to clear the protest, and lack of explanations and action to solve the delays. The week before, Morocco and ONCF were shaken by a tragic catastrophe after train No. 9 linking Rabat and Kenitra on the Casablanca-Kenitra line derailed near Bouknadel on Tuesday, October 16, at 10:20 a.m., killing 7 and injuring 125. Moroccans put the blame at ONCF after a recording of a conversation between ONCF employees went viral. The recording said that faulty tracks and absence of speed-limit signs caused the accident.